This is the same model and pose I drew last week in charcoal. I started this version in pencil, I'd like to work on it a few more sessions and do a completed drawing. The model has soft delicate folds of skin I would like to spend some time on, and the pencil will allow me more detail and softness than the charcoal. 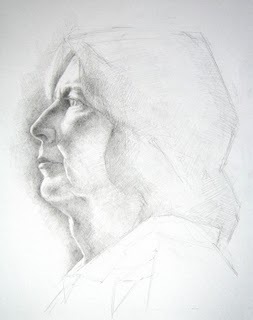 There is already a sense of strength combined with softness in this graphite drawing. You are doing it beautifully.